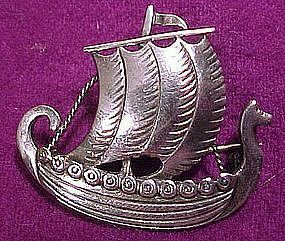 A Just Andersen sterling silver Viking ship brooch. This finely detailed vintage signed 1-3/8" x 1-1/8" pin has a safety catch, is is stamped 925 DANMARK JUST A STERLING, and it weighs 5.1 grams. It is in excellent original condition with no dents, bends, corrosion, losses, damage or repairs. All items are thoroughly and conservatively graded and all condition issues are noted; all items are secondhand and may have slight signs of gentle use. Tracked packet air insured post to the U.S. starts at $13.50 (other spots may vary). Items paid with a credit card will be shipped to confirmed addresses only. We do ship internationally. All of our prices are in $US. PLEASE NOTE: We DO NOT accept Paypal.